Explore more by Harvard Student Agencies, Inc.
From green mountains and white-sand beaches to expansive coffee fields and active volcanoes, Costa Rica awaits. You name it, our intrepid student researchers have found it--and they've made sure you can afford it. Watch Tico farmers grow coffee in Heredia, ride waves with expert surfers in Playa Tamarindo, and save turtles along the Caribbean coast before kicking back with a cold "guaro" after a day well spent. Pack your bags, hunt down an old surfboard, lose the sweater, and pick up a copy of "Let's Go Costa Rica" for a trip you'll never forget. 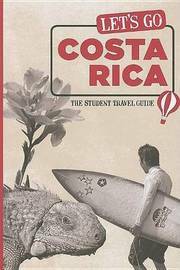 Let's Go publishes the world's favorite student travel guides, written entirely by Harvard undergraduates. Armed with pens, notebooks, and a few changes of underwear stuffed in their backpacks, our student researchers go across continents, through time zones, and above expectations to seek out invaluable travel experiences for our readers. Let's Go has been on the road for 50 years and counting: We're on a mission to provide our readers with sharp, fresh coverage packed with socially responsible opportunities to go beyond tourism.